A Search Engine is a database of intentions – and the data that search engines release to us can be some of the best market research and planning data available. With this process you can map search demand in your markets, and understand how to use search volume data for market intelligence and insight. Now, no matter the vertical your business is into, it is crucial that you know what your target market looks like before diving in and planning your SEO strategy. By the end of this article, you’ll know how to exploit data so that it drives revenue to your business. 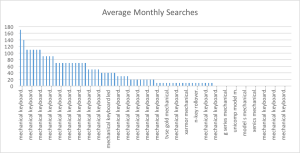 As with any SEO-drive process, you need to begin with some quality keyword research. 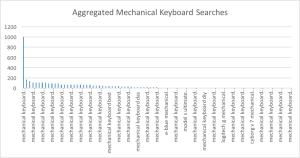 You’ll want to start by gathering an extensive list of keywords that represent searches in the vertical you are looking to dissect. The best SEO tool is always – and will always be – your brain. Put it to work , and start brainstorming a list of relevant keywords. For example, let’s say we’re working with a company in the mechanical keyboard space. 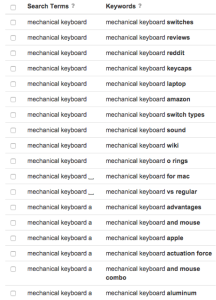 Mechanical keyboards are very loud, high-end keyboards. 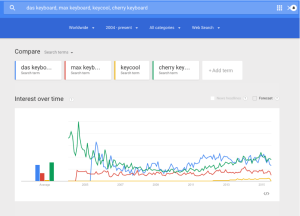 They’re tend to be very popular amongst programmers, writers, gamers, and other folks with serious keyboard needs. 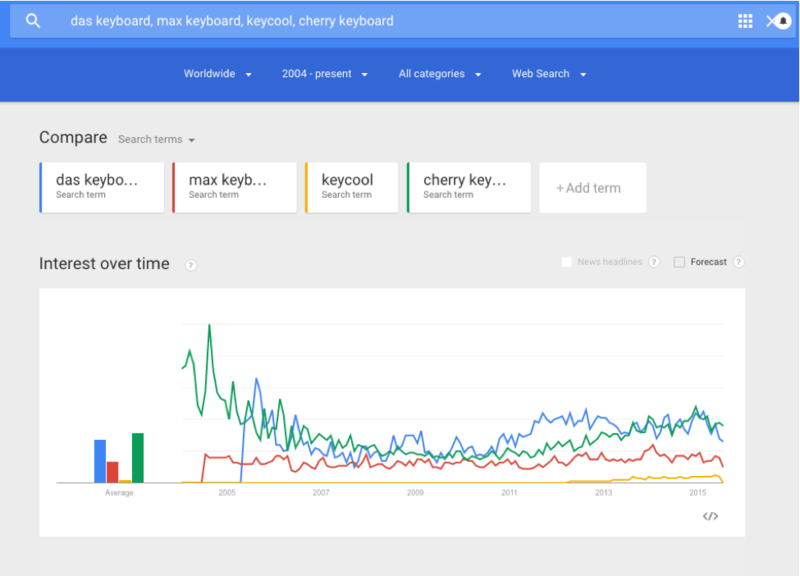 Cherry MX Keyboard – a base product term. And some other terms closely related to them. Next, I’ll expand your list with Google Suggest. You can just use Google itself, or you can save some valuable time using some of the most popular autosuggest web apps like KeywordTool.io or Ubersuggest. One of my favorite new SEO tools is Term Explorer. 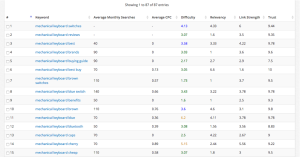 This tool enables you to both expand keyword lists, gather search volume, and get competitiveness data. It is an excellent market research tool. 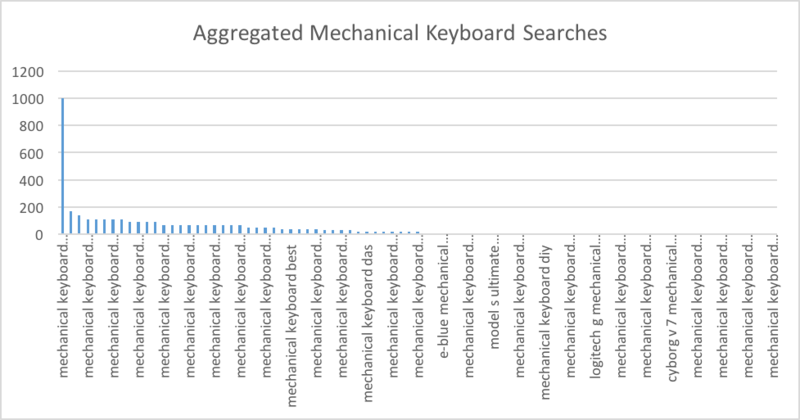 I’ll drop keywords from my previous exercise into TE’s Bulk Keyword Tool (a research and autosuggest engine capable of grabbing search data on up to 90,000 keywords) – so it will go out and find more relevant keywords in addition to our seeds. While search marketers are typically primarily concerned with non-branded traffic, or brands and modifiers, in many scenarios )especially ecommerce) it’s worth adding them into your keyword research to get an understanding of how their volume compares to that of non-brand terms. 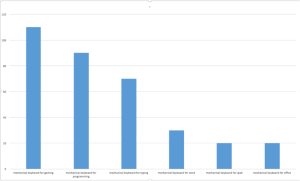 This is great data to use to get some historical perspective on the Term Explorer data. Now let’s do some analysis, and hopefully gather some insights. To get all the data you’ll need you will want to pull down everything from Term Explorer’s keyword analysis tool, and throw it into Excel (or Tableau, or R, or Python, or your favorite data visualization tool). You can use whatever you’d like – I’ll use Excel for simplicity in this example. I’ll go ahead and copy and paste it all into a table so I can pivot it later. Additionally, I’ll want to go ahead and add a “type” column, referring to what sort of search intent is behind the keyword phrase. 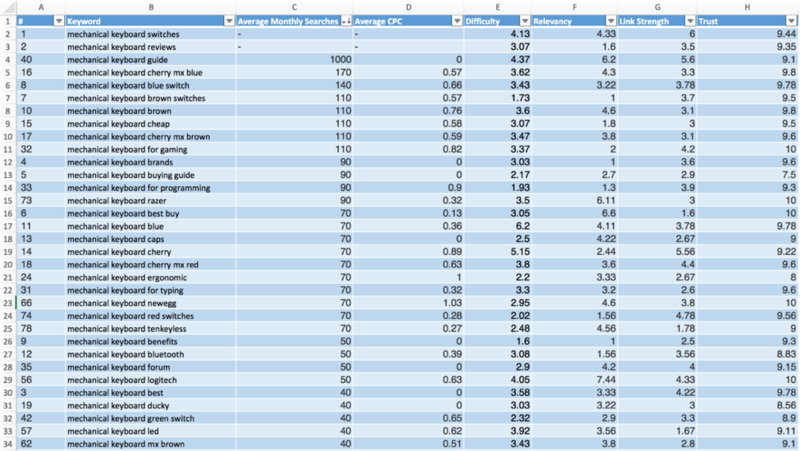 Now if you’re a search marketer, you’re probably already plotting how to use this data. But let’s start by using some basic visualization techniques to get our head around what people value in the Mechanical Keyboard space. Let’s start by looking at switches. Different mechanical keyboards have different types of switches, each with their own pros and cons. 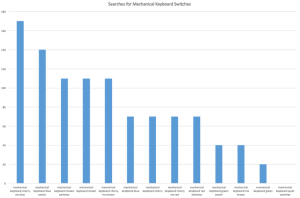 As you can see, blue switches are dramatically more popular than brown switches, which are more popular than red switches, and so on. 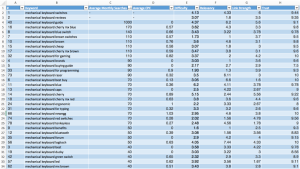 Inventory analysis – what should we order, especially if we don’t have historical data to draw on? Merchandising – Which switches should be at the top of the switch page? Probably the blue ones. Using search volume analysis in parallel with traditional techniques like market basket analysis can give you new insight into how to merchandise your site/store. Offer Creation – Knowing that blue switches are 4X more popular than red switches is a valuable insight when you’re creating campaigns, give-aways, social media updates, and more. Let’s take a look at another example, dear to our hearts as marketers. From a site merchandising perspective, we would want to create category pages around both of these topics – with very different marketing and messaging. We’ll also want to drive traffic to both of these hubs from websites and forums related to gaming and programming. 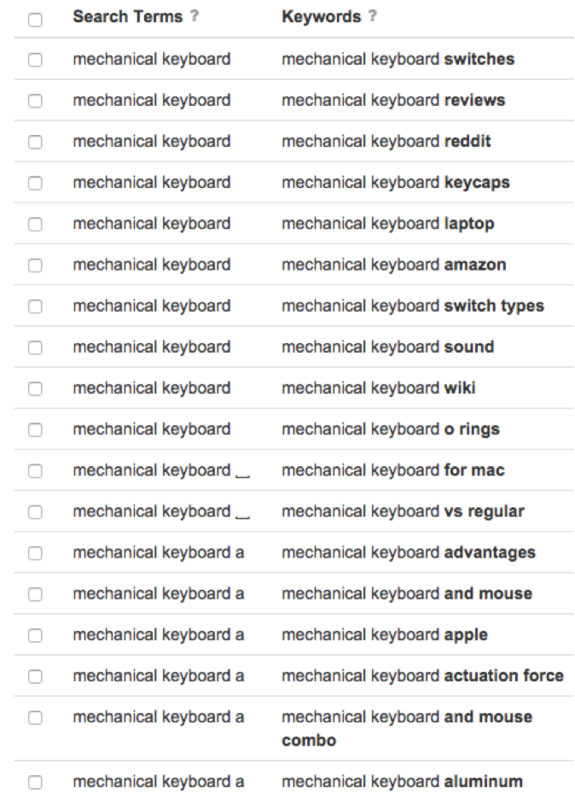 Additionally, if we’re developing our own mechanical keyboards (which would be amazing), we’ll want to include features that target these core audiences, like supporting multiple key presses and macros for gaming, or particularly excellent implementations of brackets and special characters for programming. 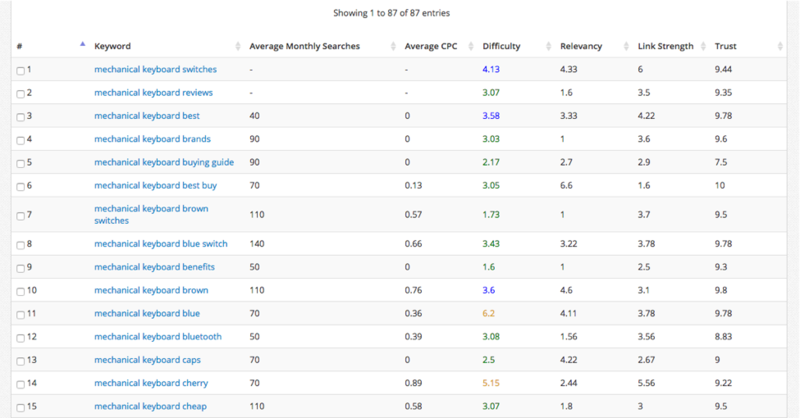 In addition to niching down to the specific searched attributes, we’ll want to look at the whole landscape – how do individual brands compare in volume versus categorical searches? 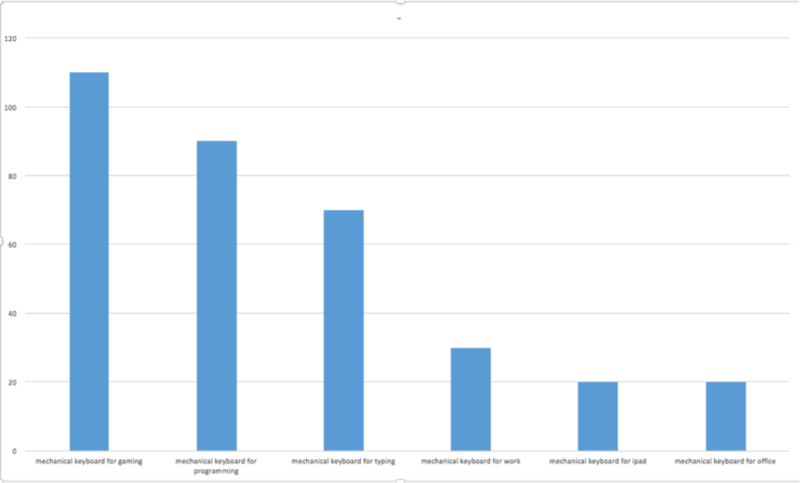 Are people more interested in a quiet mechanical keyboard or a cheap mechanical keyboard? This can be tough to visualize on larger sets of search terms – consider using an interactive tool that will let you drill down into individual results like Tableau. 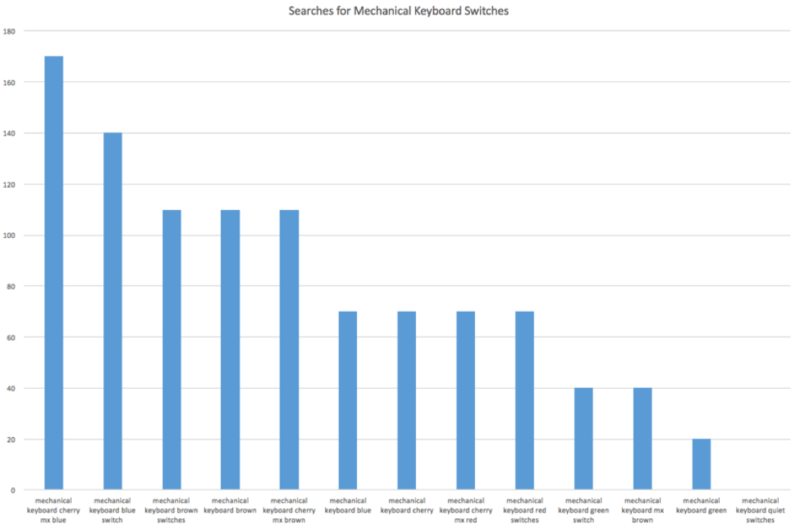 Mechanical keyboard guide has so much volume – so much – that it is an outlier. 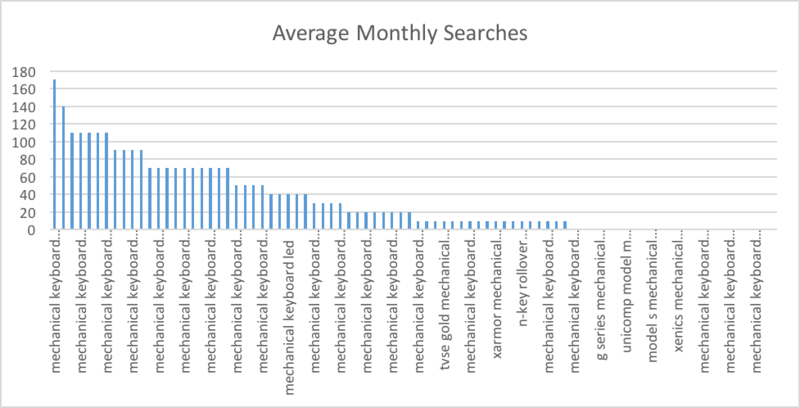 This tells us that either there is really significant searches for a mechanical keyboard guide – and we should aspire to produce the very best one we can and use a promotional strategy like Brian Dean’s SkyScraper technique. If you’re reading this publication, you know and love search as a traffic generation strategy and a direct marketing channel. But data from search engines can help with everything from inventory planning, to product development, to merchandising – basically anything that requires understanding consumer psychology. Smart usage of this data gives search marketing practitioners a chance to make an even bigger impact for their clients – and drive even more revenue. It all starts with keyword research and analysis – so put in the time to gather a representative data set, and then really work to understand the directional data that lies therein. 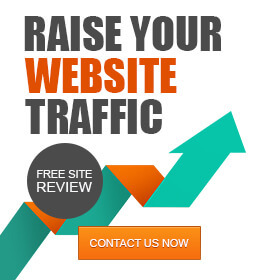 Get your SEO market research now! Request a quote! Further on you can learn how to found the solid basis of a business SEO strategy by understanding rank potential. Matt Gratt is a SaaS Growth Consultant based in Austin, Texas. He helps companies grow recurring revenue through smart digital marketing. You can see more from him at http://grattisfaction.com.